Help Complete "Harry's Last Project"! Prof. Harry Rathbun was one of Stanford's most beloved faculty of the mid-twentieth century. Born in 1894, he taught businsess law at Stanford from 1930 to 1959. His final lecture each year on the meaning of life became so popular that it had to be moved to Memorial Auditorium, and filled even that huge venue. "Harry's Last Lecture," as it came to be known, was revived in 2007 when former Rathbun student and Supreme Court Justice Sandra Day O'Connor gave the innaugural address in an endowed series of Rathbun lectures. Justice O'Connor credits Prof. Rathbun with motivating her to study law and, more importantly, convincing her that a single, caring individual could make a difference in the world. My own connection with Harry Rathbun began in the summer of 1980, when my wife Dorothie and I attended a seminar sponsored by a group that he and his wife Emilia had founded. When Ronald Reagan assumed the presidency in 1981, he brought the nuclear threat into sharp focus. Whereas previous presidents had anesthetized the American public with implied assurances that these awesome weapons would never be used, President Reagan openly discussed nuclear war fighting plans that had been in place for decades. His honesty, while shocking, stirred many of us to action. The group founded by the Rathbuns in the 1940's changed course and dedicated itself to eliminating the nuclear threat. What was the point of helping people lead a meaningful life if life itself was in doubt? Because every small war has some chance of escalating into a nuclear conflict, all war had become too dangerous in the nuclear age, and the group became known as Beyond War. Beyond War grew up in the shadow of Silicon Valley, and its members included a number of successful Valley entrepreneurs who became full-time volunteers. While unusual by societal standards, that model of total commitment was catching, and in 1982, Dorothie left her career as a CPA at a big eight accounting firms to become Beyond War's Vice President for Financial Support. Two years later, I took an eighteen month leave from the university to work within Beyond War. With only two exceptions – the bookkeeper and the president – Beyond War was entirely a volunteer operation. At its peak, in 1988, it had approximately 500 full-time and 20,000 part-time personnel. My most concrete contribution to Beyond War was as Western Editor of the book Breakthrough: Emerging New Thinking, supported by Beyond War in the West and the Soviet Academy of Sciences in the East. It is available on line, free of charge. While I still believe that eliminating "the nuclear sword of Damocles" that hangs over humanity (see YouTube video below) requires totally rethinking our approach to war and peace, my current project does not emphasize that connection. When I first considered these matters, it took considerable time for me to break out of the societal mindset and see things differently. If I try to impose my view of the solution on others, that alienates most people and narrows the potential pool of participants far too greatly. If I am right about the nature of the solution, it is better discovered by each individual at his or her own pace. Or, if I am wrong, I will discover that instead. The first, critical goal is to create awareness of the unacceptable risk posed by nuclear weapons. Only after enough people have become "nuclear aware" can we start changing policy, and only then can the debate move to specific solutions. 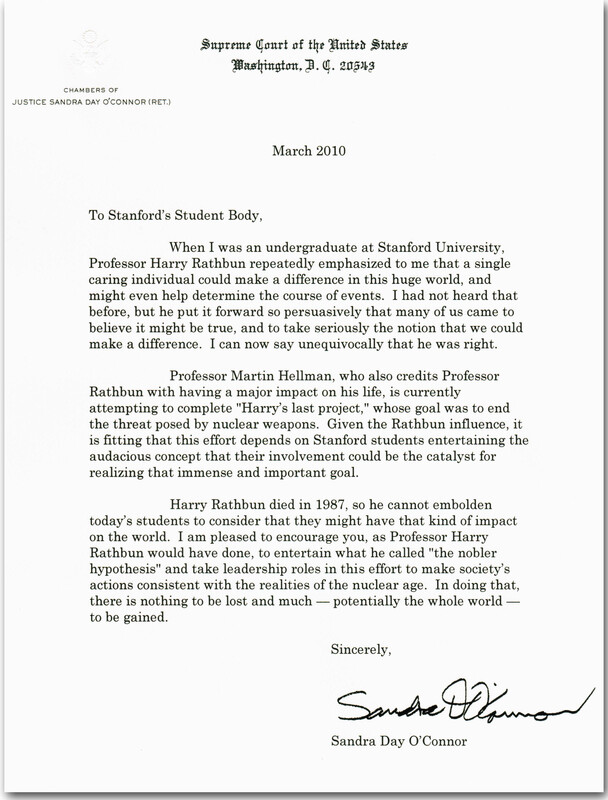 The second Rathbun Fellow, former Secretary of State George Shultz, also is encouraging students to participate in this effort to make Stanford a pocket of nuclear awareness, as are several other prominent members of the Stanford community. Sign our petition asking Congress to authorize a National Acadmies study of the nuclear risk, and encourage friends to do the same. Be sure to read How to Increaase Your Effectiveness. It will take only a few minutes and repay that effort many times over. Read our home page and reach your own conclusion about whether or not society's approach to nuclear weapons demands change. If you agree that change is needed, get one of our "Nuclear Risk" T-shirts and put one of our posters on your dorm room door. Review the story that goes with the drawing on the T-shirt and poster. It's next to the drawing, near the top of our home page. Encourage those who express interest to become involved. Of course, there's a lot more that you can do and our resource page has a number of suggestions. But the actions listed above are the first, key steps.